We love when happy customers share their building projects with us! Ron Yeager from Bath, Pennsylvania came to Future Buildings to help him with the ideal garage to fit his property and vehicle. He settled on our 14 x 20 “S” model which we all agreed would suit his purposes nicely. It was a communal prep and assembly effort with his friends and family as you will see. 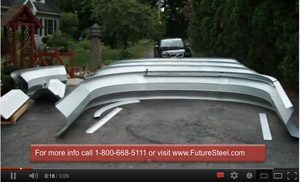 In just a couple of days his brand new steel garage was up and in use! We are thrilled to see Ron’s finished garage that is the perfect protection for his new car and we are so grateful that he took the time to also complete a “Do-it-Yourself” slide show of the whole project.